Mugwort (Artemisia vulgaris) growing in Oconee Forest Park, Athens, GA. The underside of the leaves are silver. The gut has been called the second brain because of the number of chemical molecules which communicate to the brain, impacting mood, thought, and physiological actions. However, if for every one signal the brain sends to the gut, there are nine signals which travel to the brain, then we might actually say that the gut is the primary brain. With the brain being dictated to by the gut, it is no surprise that when the digestion becomes sluggish, so does the brain and the mood. Herbal medicine has a class of herbs to address digestion, and thereby mood–in fact, some say it is what herbal medicine does best. One of the herbs for a particular type of indigestion and depression is mugwort (Artemisia vulgaris). Though it isn’t a Middle Earth-Lord of the Rings remedy as its name sounds, it is an old remedy of Europe, Asia and Africa used for thousands of years, which has naturalized as a weed in North America. A species native to the western U.S. (Artemisia douglasiana), can be used interchangeably. Mugwort is a warming, aromatic bitter, containing caffeoylquinic acids (some of the same constituents found in artichoke (Cynara scolymus) which protect from lipid peroxidation), essential oils, and sesquiterpene lactones, which reduce inflammation and improve the cellular structure of smooth muscle of blood vessels, helping with atherosclerosis. 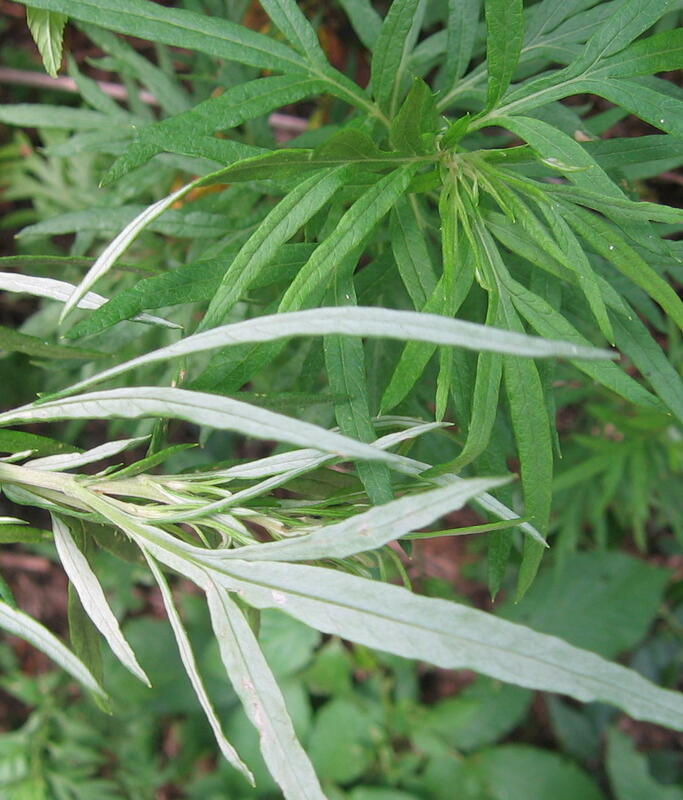 The pattern of disharmony that calls mugwort to mind is termed the “Classic Liver Pattern”. The person has difficulty digesting fats, though craves fatty junk food, and tends to feel hung-over from the lack of digestive power. The person wakes in the morning feeling worse, and has low energy. This is a good indication for mugwort, particularly if associated with depression. According to Galenic medicine, the liver is the source of blood, vitality, and emotions. When the liver is cold, damp, stuck, then the emotional body also feels depressed, sad, slow…blah. Herbalists see this type of atonic depression as a whole-body experience, where the person is stuck, they slow down, and they also really feel the depression in the digestion. For women, mugwort is used in cases of congestive dysmenorrhea, when a woman feels a dull, heavy, downward dragging energy in the pelvic area prior to menstruation. This is due to the dilation of veins in the uterus. Mugwort is either used in teas or tinctures. When it is brewed or tinctured, it creates a beautiful, dark color which is spicy and bitter at the same time. In acupuncture it is burned in rolled cones or sticks for moxabustion, where it is applied to areas experiencing stagnation. Mugwort is a short-term remedy, and is best used in combination with other herbs. Avoid it during pregnancy. A long tradition exists of using mugwort to enhance dreams. People place the herb in dream pillows or simply in the pillow case to induce more vivid dreams. There is little science to verify this folkloric use, but there is no harm in trying it. I would advise you against planting various Artemisias in your garden unless you have a very large space for it. Most Artemisias will spread considerably. Though they have attractive foliage, they won’t be so attractive when it takes over other plants considered dear to the gardener.